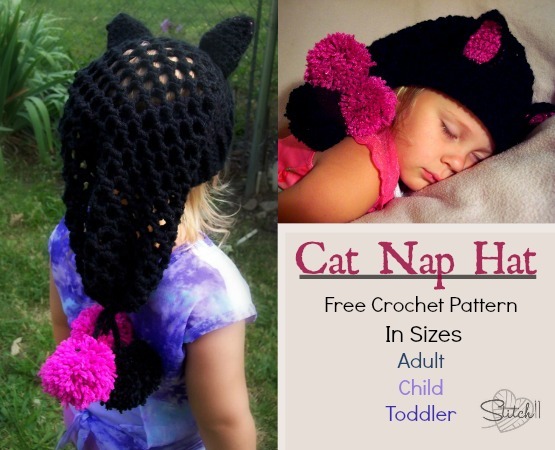 This fun cat lover crochet hat is designed to have a warm, stretchy & snug fit around the ears. 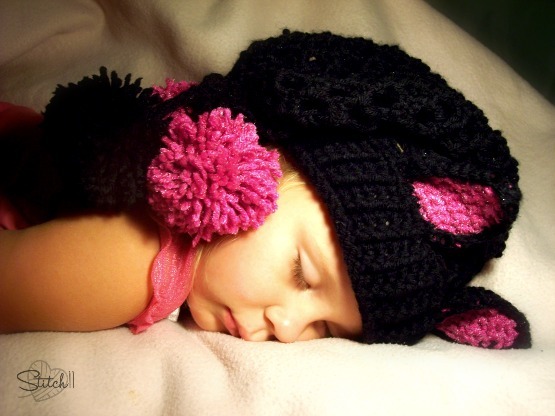 The hat (in sizes adult, child, and toddler) is great for all seasons and all reasons! Round 1: FSC 52 (56, 60) Join to first FSC. Round 2: CH 1, FPSC 52 (56, 60) times. Join to first FPSC. Round 3: CH 1, **FPDC into next stitch, SC into next stitch. Repeat from ** around. Join to first FPDC. For Toddler size repeat Round 3 two more times. For Child size repeat Round 3 four more times. For Teen/Adult size repeat Round 3 five more times. Round 1: CH 1, SC into the back loop of the next 52 (56, 60) stitches around. Join to first SC. Round 2: CH 1, **SC into next 2 stitches. CH 3. Skip 2 stitches. Repeat from ** around. Join to first SC. Round 3: Slip stitch into next SC. Slip stitch into CH space. CH 1, 2 SC into CH space. CH 3. **2 SC into next CH space. CH 3. Repeat from ** around. Join to first SC. For Toddler size repeat Round 3 twenty more times. For Child size repeat Round 3 twenty five more times. For Teen/Adult size repeat Round 3 thirty more times. Round 1: CH 1, SC into each SC around. (Skipping over ever CH space) Join to first SC. Round 2: CH 1, SC DEC around. Join to first SC DEC.
Weave your yarn back and forth around each stitch around. Pull your yarn end and the hole should shut. Using your yarn needle.. go ahead and secure this hole shut. Join the yarn to the center of the top of the hat. ** CH 11, slip stitch back up the CH. Slip stitch into the top of the hat. Repeat from ** 2 more times. Use the Secure Pom Pom Tutorial for making 3 pom poms. Attach them to the end of your pom pom strings using your yarn needle. Make two in main hat color and two in contrasting color. Attach the contrasting ears over the main colored ones with a SC around the edge. Start at the right side and finish off on the left side. Put 3 SC into the top, center of the ear. Then attach the ears onto the hat, just behind the brim.